How do I back up my recipes? Can I transfer my backups between different versions of Paprika? There are three different methods you can use to back up your recipes. 1. 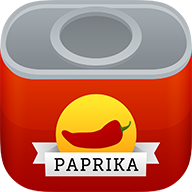 Paprika Cloud Sync (recommended) - You can create a Paprika Cloud Sync account to automatically sync your recipes, grocery lists, and meal plans to our cloud servers. It's a free and unlimited service and your best bet for backing up your recipes. It is also platform-independent. 2. Manual Backups (Paprika 2 only) - You can create manual backups inside Paprika by going to Settings -> Manual Backup -> Create Backup. Once the backup file is created, make sure to copy the backup file to your computer using iTunes File Sharing. 3. iTunes Backups - Your application data is automatically backed up whenever you sync your device with iTunes or back up to iCloud. However, if you lose your iPad or get a new iPad you'll need to restore your entire device from one of those backups to be able to restore Paprika's data. We encourage you to use our free cloud sync service, then if you acquire a new device you can simply log in to your sync account to redownload all of your data.